Knowing how to prepare for a nuclear attack is probably more important now than it’s been for decades. While the risk of a hostile nuclear incident was once the preserve of Cold War flashbacks and dramatized movie scenes, the rise of non-rational state actors on the world stage as well as emerging and resurgent superpowers, increases in global terrorism and a general increase in tensions, the unthinkable is now back on the table. We’ve put together the ultimate guide to help you prepare, survive and thrive if a nuclear attack or blast event were ever to take place. Nuclear attacks and the after-effects of a blast can be prepared for ahead of time. This is an absolutely crucial factor to keep in mind when thinking about this subject, and with any other disaster situation. There will, of course, be uncertainties and unknown factors that come into play with this kind of incident – there always are – but there are also a whole load of things that we do know about the effects of a nuclear blast and the likely events before, during and after an attack that can be anticipated and prepared for. Armed with this knowledge, you can get to work preparing a response strategy and plan that can be called upon in the event that a nuclear attack seems imminent. With this in mind (and as is the case with every other disaster or emergency situation), it’s imperative that you don’t go into this topic led by a fear mindset. This kind of disaster and the associated survival considerations are just a problem, and every problem ultimately has a solution. The purpose of this guide is to tell you how to prepare for a nuclear attack, providing you with as much knowledge and as many practical solutions as possible to understand the risks, threats, and effects of this kind of event to allow you to implement a tactical and strategic response to surviving any eventuality. 1.1 What is a Nuclear Blast? As with all things related to emergency preparedness planning, understanding the threat is half the battle when it comes to making sure that you’re able to respond without hesitation and mitigate the effects on you and yours. To get an idea of just one kind of catastrophic nuclear event that could feasibly take place, this scenario from former U.S secretary of defense Dr William J. Perry is recommended viewing to help you understand the situation. 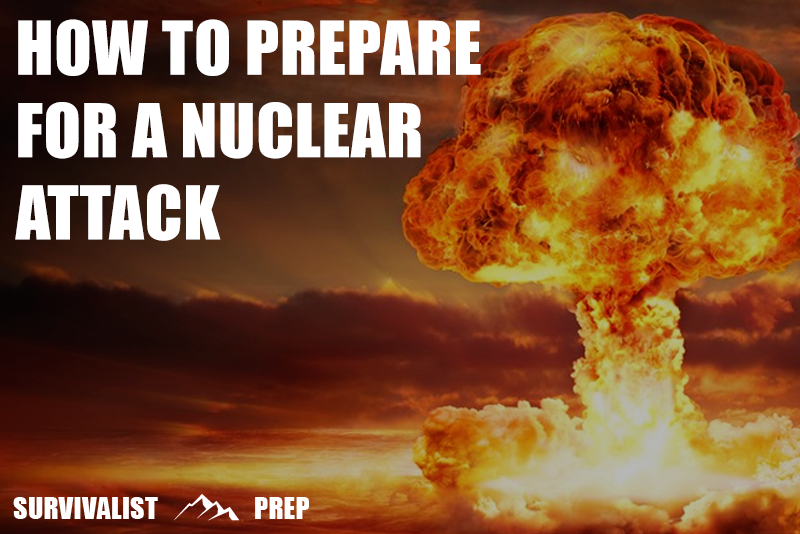 Knowing how to prepare for a nuclear attack, blast, or other nuclear incident is no different, and an ounce of prevention ahead of time is worth a pound of cure in the event of a disaster. When a nuclear weapon is detonated, the resulting explosion or ‘blast’ comprises a series of deadly and destructive effects. Most of the physical destruction from the blast comes from the initial explosion that creates incredibly intense, blinding light, extreme heat and a powerful pressure shock wave that spreads outwards, capable of leveling buildings far from the detonation point. The first effect from a nuclear blast comes from the light and heat expelled from the detonation (the thermal radiation). The heat that radiates outward from the blast accounts for around 30-40% of the energy from a nuclear explosion and travels at about the speed of light. Immediate hazards from thermal radiation come from flash-blindness which is caused by looking towards the explosion upon detonation and through burns caused by the extreme heat that is expelled from the explosion. Flash-blindness can vary in intensity depending on factors such as distance from explosion and intensity of flash/position of the viewer and can be either temporary or permanent depending on these factors. The thermal heat caused by the light can primarily cause first, second and third-degree burns depending on the distance from the blast as well as igniting flammable materials meaning the likelihood of wide-spread fires and explosions (from fuel lines etc) is extremely likely in urban areas. In the same way that thunder is heard after a lightning flash, seconds after the thermal radiation effects, a nuclear blast’s pressure wave releases an enormous amount of energy in all directions from the detonation point. A nuclear blast can happen either at ground level or above the ground at a designated height in the air in what’s known as an airburst and both of these types of detonation can cause different levels of damage. The form that a possible nuclear threat takes will ultimately vary, depending on the aggressor who launches the attack and can range in size from a weapon mounted on an intercontinental ballistic (ICBM) or short-mid range missile, through to a miniaturized portable device transported on a person or in a vehicle. By far the largest volume of active nuclear warheads rests in the hands of nations that own them. While eight nations have actually detonated nuclear weapons, there are officially five countries currently considered to be “nuclear-weapon states” and these are the US, Russia, the UK, France, and China. India, Pakistan, and North Korea (see Rogue States below) have all also successfully tested nuclear weapons. Similarly, although not confirmed, it is widely believed that both Israel and possibly South Africa have access to nuclear weapons technology (although the latter dismantled its developed weapons before joining the Nuclear Non-Proliferation Treaty). Other countries including Iran are believed to have been developing technology leading up to the development of nuclear weapons, although the jury is still out on this. Ever since the United States first deployed nuclear weapons against the Japanese cities of Hiroshima and Nagasaki in 1945, the race for major world powers to develop and enhance their own nuclear projection capability has grown. This escalated during the Cold War of the twentieth century, primarily between the US and USSR, with both nations holding by far the largest numbers of nukes in their respective arsenals. It’s generally agreed that the deterrent effect of mutually assured destruction (MAD) is what has ultimately kept major powers from even a limited nuclear exchange up to now, with the widely-accepted view that a strike by one nation would almost certainly result in a reciprocal attack by the other, destroying both and benefiting neither. With that being said, there is still a very real and credible threat that in the event of a conventional conflict in the future between competing powers, escalation could very easily lead to a nuclear attack – particularly if one side is losing. Perhaps most worrying in recent years continues to be the increase in rogue states such as North Korea developing nuclear weapons and the potential for a ‘non-rational actor’ to disrupt the globally accepted norms in an unpredictable and potentially devastating way. The introduction of this kind of ‘unstable element’ to the established status-quo is particularly worrying if a rogue state (usually under an authoritarian regime) feels that it’s on the strategic back foot and/or is under existential threat either on a nationwide level or at the level of leadership. If a rogue state with nuclear weapons feels backed into a corner, all bets are off when it comes to their potential response. The biggest threat here comes in the ability of a state to effectively deliver a nuclear weapon to an intended target, either as a payload on a missile or via an agent on the ground. With great power comes great responsibility, authoritarian states may not necessarily respect this and almost certainly won’t play by the usual set of rules established by the international community. The third threat comes in the form of a nuclear device which is detonated by a terrorist organization. It’s unknown just how likely this scenario is in practical terms, but what is known is that there are a number of nuclear weapons that have simply ‘gone missing‘ over the years. If an atomic device were to fall into the hands of a capable terrorist organization, it’s widely accepted that the motive to deploy it in a populated area would certainly exist, it would be down to security services to uncover and foil the plot before it was too late. There’s a good chance that many, if not all of the above will be adjacent to, or located within, major population areas such as towns or cities. With this in mind, as a general rule of thumb, once you’ve outlined your immediate proximity to any of the above locations, you should then look to also assess your distance from major population centers to know your options and ensure your safety in the event of a nuclear attack. In an exchange between major nuclear-armed states, the main strategic objective of a nuclear strike will almost certainly be an initial ‘decapitation move’ to neutralize the ability of the target nation to respond with equal force and to ensure as much damage to communication, military, and energy infrastructure and capability as possible early on. In the case of a terrorist act involving nuclear weapons, it’s highly probable that the main objective will simply be to maximize civilian casualties, in which case high population urban centers and major cities are most at risk of an attack. Distance from the detonation point correlates directly with your survival chances. It’s important to distinguish between the distinct but equally critical survival requirements that exist during and after an atomic blast. As discussed earlier in the guide, there are a specific set of threats which exist at the moment of detonation as well as those which follow the blast and it’s imperative you have a good understanding of each. When a nuclear blast occurs, the majority of damage and casualties are caused by a combination of thermal radiation effects (heat and light from the blast) alongside the resulting physical pressure wave from the explosion which has the power to demolish buildings and is comparable in intensity to the high winds of a gale or hurricane situation, along with the subsequent consequences of these types of event. After a nuclear explosion, the biggest threat to life comes from ionizing radiation (alpha and beta particles and gamma rays expelled from the detonation of a nuclear device after the explosion). Fallout is the term given to the deadly radiation that spreads out and ‘descends’ from a nuclear detonation after being lifted high into the air from the initial fireball and iconic mushroom cloud of the main explosion. The fallout after a nuclear blast will eventually settle but remains highly radioactive when it does, meaning you need to avoid exposure at all costs and brush any and all dust and debris off of you before leaving your clothing outside of the home if you suspect you’ve been exposed. The good news is that fallout radiation decreases in intensity (radioactivity) pretty quickly and poses the greatest threat within the first two weeks of a nuclear explosion. Once this two week period has passed, the radiation level is likely to have fallen to about 1 percent of what it was initially. In the event of being caught within the effect radius of a nuclear blast, learning the following key points could save your life. Be sure that every member of your household is similarly clued up on what to do and test each other regularly so if the time comes, you all know what to do. – If a detonation occurs, do not look at the flash or fireball – the intense light has the potential to blind you. – Seek shelter immediately – radioactive fallout can be carried for many miles. – Remember the three priority factors for ensuring protection: Distance, Shielding and Time. – Get clean as soon as it’s possible to do so removing all radioactive material that may have settled on your body. – Wipe down all exposed extremities and wipe your eyelids with a clean wet cloth as well as your ears. Gently blow your nose to expel any contaminants. – Place contaminated clothing in a plastic bag and seal or tie it. Place the bag as far away as possible from humans and animals – removing the outer layer of clothing can remove up to 90% of the settled radioactive material. – Wash with lots of soap and water. Do not scrub or scratch the skin. Do not use conditioner because it will bind radioactive material to your hair. Knowing how to prepare for a nuclear attack begins with knowing how likely you are to be affected in the event of a serious incident taking place. Begin by carrying out a geographical risk assessment of your situation in terms of your distance from potential targets and the effect this would have if a device were to be detonated. A good place to start when carrying out this exercise is the excellent Nuke Map tool which gives you a graphical representation of the effects of various yield nuclear detonations on any location of your choice. Input the data of your nearest major urban area or military/civil infrastructure facility to get a good idea of what effect a detonation at this target would have on your home location. If you can read this text, your browser does not support iframes. Sorry. Depending on the size of the blast (again, you can specify different yields of weapon in the tool), if you live in or directly adjacent to a potential target area, it’s highly likely that you’ll be affected in a big way if an attack were to take place. If this is the case, don’t worry – we’re going to use this knowledge to develop a workable survival action plan if the situation ever looks likely. In the instance that your home location is not affected directly by a nuclear blast, you’ll still need to consider the effects of radioactive fallout as well as the serious follow-on impacts of a nuclear emergency, both of which we’ll cover in detail further on. Assuming that you have some degree of pre-advanced warning of an imminent nuclear attack, there may or may not be options open to you in terms of whether you need to stay put or evacuate an area. If you live in an urban area or city that you feel is a potential high-risk zone, your best bet will almost certainly be to implement a bug out strategy and head for a pre-determined safe place ahead of everybody else with the same idea. If your home is situated outside of the likely blast-effect radius of a detonation, you’ll still want to be considering your options regarding whether to hunker down and prepare your property or to evacuate to another area entirely. The decision you make here will probably be based on a number of different factors as well as your level of preparedness and any redundancy measures you have in place for an unfolding emergency situation. Whether you’re planning on bugging in or evacuating, there are a few essential steps that everybody should take to make sure you’re prepared for absolutely any scenario that arises in the event of a nuclear attack. Firstly and without a shadow of a doubt, you need to assemble a comprehensive bug out bag that you can grab and go if you need to bail out quickly and without a moment’s notice. Providing you with a portable survival kit with provisions and equipment to last you for 72 hours or longer, a well-considered bug out bag becomes your lifeline if you need to leave your home in a hurry. Having this in place ahead of an actual emergency will buy you critical time when an instant decision is needed. You should also look to make sure that you have a basic home emergency supply kit in place with everything you need to survive for 1-2 weeks with the ability to rapidly scale this up to a longer provision period if the threat level begins to increase. Prepare a household or family emergency plan that lays out the exact strategy you’ll use in the event of an emergency and make sure everybody knows their role and what to do in the event of an emergency without even thinking – think of this like fire drills at school or work. If you have kids, designate a specific task for them to do if you need to implement your plan – they’ll be glad to be involved and it can make all the difference when you actually face an emergency situation. If you live or work in an urban or suburban area, get in touch with local officials and find out the location of the nearest officially designated fallout shelters (if there are any), mark them on a map and learn their locations. If there are no specifically designated areas for fallout protection, make a list (and mark on the map) every potentially accessible shelter in the area such as subways, tunnels, and basements. These will not be your primary choice of protection in a disaster, but if you’re caught totally off guard in an emergency situation, knowing their whereabouts may be critical to your survival. If your home is located far enough away from ground zero of a nuclear detonation, your immediate focus needs to be on the likelihood of exposure to the radiation after-effects and any fallout from the blast. How far are you from a potential target and is this far enough to negate the risks of potential fallout? If not but you’re planning to stay in your home regardless, you will need to employ every possible measure to maximize your shielding and protection from the follow-on effects of an explosion. Once this has been considered, other survival factors will come into play and will involve ensuring total home preparedness for everything from prolonged power outages and no utilities (both highly likely following an attack) as well as sufficient provision for clean drinking water and enough food to get you through potentially weeks of laying low. The provision for supplies in your home needs to last you a minimum of two weeks and ideally longer as this is believed to be the time taken for any fallout from a nuclear blast to decline to 1 percent of its initial radioactivity. With this being said, you really want to aim to store more than this, ensuring coverage of water, food, heating, light, sanitation and medical supplies for every member of your household over this period. The priority when thinking about how to prepare for a nuclear attack at home is ensuring that the internal environment of your home remains as protected as possible from all external threats and adverse effects the moment a warhead or device detonates. In any serious emergency or disaster situation, whether it be an earthquake or a nuclear attack, it’s imperative that you secure enough clean drinking water to meet the minimum requirements for every member of your household for as long as possible. When it comes to food and water, hydration is the undeniable priority given the rapid onset of dehydration and the consequences. If a nuclear attack is imminent, make preparations to store as much water as possible in every available container in your home. If your home is sufficiently outside of the blast radius and an attack is underway, fill every container in the house (bathtubs, sinks, glasses, cups, bottle, buckets and bowls) with water from the mains supply before the pipes run dry. This is your priority if the rest of the house is secure and you and your family are safe. You should make provision to have anywhere between 2 weeks and a month’s worth of clean bottled drinking water stored for every member of your household if at all possible as well as filtration and purification methods should you need to call on them as a last resort. No matter where you live in relation to a nuclear blast, leaving the house will likely not be a viable option for days if not weeks in the aftermath of a serious event. With this fact aside, following on from a nuclear attack you can also expect severe disruption to almost every service, and food logistics will be no exception to this rule. It’s therefore important to make sure you have enough suitable food stored in your home supply to see you through until it’s safe to leave. The main considerations around your emergency home food supply follow the usual requirements of emergency food planning in that your supplies must have a long shelf life, be easy to prepare and have high nutritional value. With the high probability of a complete loss of power for a prolonged time period, the food you choose must also not require refrigeration or freezing which makes a solution like freeze dried emergency meal kits an excellent choice for storing until needed as well as a high-quality cooler box for shifting your existing food from the refrigerator. Similarly, whether you usually cook using gas or electric, in the event of a nuclear attack, both will almost certainly be taken out of action meaning you’ll want to have a dependable alternative that you can operate safely indoors. Emergency meal kits with enough nutritional and caloric value to meet the needs of your entire household for 2-4 weeks. It’s almost a certainty that from the moment of a nuclear detonation, the power grid and all communications will be brought down, with no possibility of coming back online for maybe weeks on end. The primary cause of this will be an electromagnetic pulse or ‘EMP’ which would be triggered upon detonation of a nuclear device, knocking out electrical systems, electronic devices and communications infrastructure over a potentially wide area. These immediate effects of an EMP can be far-reaching and could impact you even if you’re a significant distance from the blast area, so expect blackouts and prepare accordingly. The next, more permanent damage to the grid will be caused by the physical effects of the explosion itself, with the blast taking down power lines, communication towers and other supporting infrastructure and causing long term power outages. In both of these instances, it’s important to remember that you’ll almost certainly be without power for a considerable length of time in the event of a nuclear attack and to make sure you have enough redundancies in place to cover this. At a basic level, you’re going to want to make sure you’ve got multiple sources of illumination in the form of durable flashlights and lanterns as well as crank operated and battery powered alternatives. A conventional gas-powered emergency generator or a solar generator system should be considered an essential redundancy to call upon if you find yourself without power to maintain the operation of essential electrical devices, appliances, and equipment. As with all of our preparedness guides, we reference as many expert sources, real world user reviews, and opinions as possible so we’re able to provide the most relevant and educational information on how to prepare for a nuclear attack. Knowing how to prepare for a nuclear attack is ultimately a highly personal activity with individual needs and preferences sometimes varying considerably between people, locations, and specific situations. With these considerations in mind, this guide looks to provide advice on our own opinions of how to prepare for a nuclear attack, however, it’s always important to carry out your own due diligence to find the best solution for you when developing a strategy, plan, and solution that’s perfect for your situation.